U.S. Catholic Priest Charged With Sexually Abusing Boys In Philippines The Rev. Kenneth Hendricks faces charges in Ohio — where he was previously based — of engaging in illicit sexual conduct in foreign places, a federal crime. American priest Kenneth Hendricks is accused of abusing at least 10 young boys in the Philippines; U.S. officials who sought his arrest are now trying to learn if there are any victims in Ohio, where he was previously based. The Rev. 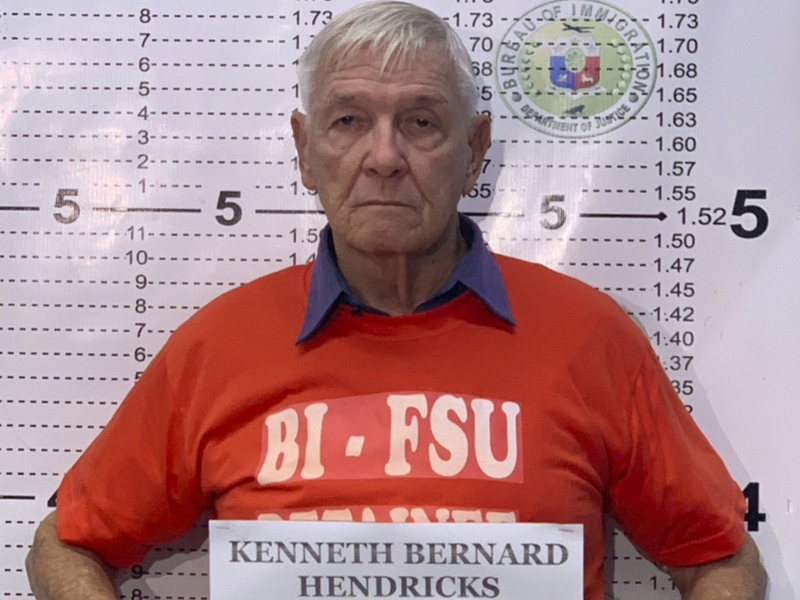 Kenneth Hendricks is under arrest in the Philippines, after U.S. and Filipino officials learned of allegations of sexual abuse against the Catholic priest — including accounts that he "had a number of minor boys residing with him," prosecutors say. Hendricks, 77, faces charges of engaging in illicit sexual conduct in foreign places, a federal crime that could result in up to 30 years in prison. The case is being run by the U.S. Attorney's Office in the Southern District of Ohio — where Hendricks was previously based. So far, the authorities have identified 10 victims — including four who came forward at a town hall meeting held in the Philippines. One victim told agents the priest sexually abused him numerous times, starting in 2012, when he was around 12. Another said he was first abused when he was seven. All of the accounts had similarities, said U.S. Attorney Ben Glassman, with the boys saying they met Hendricks through his official work in the church; some had inquired about becoming altar boys. Their shocking stories account for dozens and dozens of sexual attacks. "Hendricks allegedly had a number of minor boys residing with him. It is alleged he insisted they take baths together, and would molest the victims alone or with other boys. The priest allegedly warned the victims that if they told anyone they would all go to prison." The U.S. attorney's office also released partial transcripts of a conversation between Hendricks and one of the victims, in which they discussed what might happen if the boy spoke out about being abused. Predicting a meeting between the boy's parents and the local bishop, Hendricks allegedly said that a key question would likely be if the family wants to press charges. The priest is quoted as saying, "they will decide, ask you what your decision is, what you're going to do, whether there will be a case or not or whether, you know, a settlement, I don't know. But as far as after that, I don't know what's going to happen. I really will have to probably really resign, retire now." Describing how the case against Hendricks developed, Special Agent in Charge Steve Francis of Homeland Security Investigations said that on Nov. 13, HIS agents in Manila "received information alleging that Mr. Hendricks sexually exploited numerous boys residing in Naval, the Philippines." Agents are now trying to gather more evidence from victims and potential witnesses, in both the Philippines and the U.S.
Hendricks has been active in the Catholic Church for more than 60 years, Francis said, mentioning assignments in Cincinnati and several locations in the Philippines. "Given what we know thus far, we believe there is a high probability that other children may have been impacted by his alleged actions," Francis said. Calling for anyone with information about Hendricks to contact the HIS office in Cincinnati, Francis repeatedly recited the office's phone number: (513) 246-1461. The arrest comes less than one month after U.S. agents in the Philippines first heard about the allegations against Hendricks, who is currently being held by the Philippines' Bureau of Immigration. Calling the case "shocking and appalling," the Philippines' Bureau of Immigration spokesperson Dana Krizia Sandoval said of Hendricks, "his presence is a threat to the safety of our children." The priest was arrested Tuesday evening, local time. The Filipino agency says the U.S. embassy is "reportedly processing the revocation of Hendricks' passport to help facilitate his immediate deportation." Describing Hendricks' movements in recent years, Glassman said the priest had a yearly habit of returning to Cincinnati. The priest would often pass through Los Angeles before visiting Ohio for months at a time, he said. While details about his work in the Philippines are still being investigated, Glassman said that Hendricks is mentioned as a missionary on the website of the archdiocese of Cincinnati. A check of that website on Thursday showed that a note had been attached to declare, "Fr. Hendricks is not, nor ever has been, a priest of the Archdiocese of Cincinnati." Glassman said federal investigators are trying to ascertain the relationship between Hendricks and the archdiocese. When asked whether Hendricks might have been assigned to work in the Philippines because of concerns about potential abuse, Glassman replied, "The investigation is ongoing, so certainly, whatever are the circumstances that caused Father Hendricks to be doing missionary work in the Philippines, as opposed to stateside, is something that we want to get to the bottom of." "The United States has an obligation to protect the most vulnerable," Glassman said. "It is a solemn obligation to protect children from sexual abuse." "Our reach is global," he added, citing his office's work with other agencies. "We can catch the offenders, and we will catch the offenders."